It has been confirmed that the launch event of iPhone 7 is about to be held on September 7th. Pretty soon, people around the world will be able to get access to this brand new iPhone. For those who have been using iPhone 4/4s, iPhone 5/5s, or iPhone 6/6s for a long time, this would be a great opportunity to get rid of the old phone and get the latest one. Once you buy it, to transfer photos from old iPhone to iPhone 7 is one of the primary things you need to take action. Thus, some fast ways will be introduced here to save your time and energy. Without further ado, let’s check them out. There are numerous file transfer apps on the market right now. Concerning the aspects of handy operation and fast transfer, this ApowerTrans app is really worth trying. Like other similar ones, this app is compatible with both Android and iOS phones. With its help, you can transfer photos, music, videos, documents, apps and more between phones. This application has a clear interface so that users can deal with it easily. To move iPhone photos to iPhone 7, you just need to follow the step-by-step guide. Download it on your iPhones. Click the button below, which will lead you to App Store. Connect your iPhones to the same WiFi network. On your old iPhone, go to “Albums” tab. Tap “Select All”, select the photos or folders and tap the “Send” button at the bottom. Then it will automatically scan the nearby devices. Choose iPhone 7 and build connection. After successful link, tap “Send” to begin the transfer process. The photos will be copied to your iPhone 7 within a short time. Moreover, you may tap the icon on the upper right corner to check the transfer history. AirDrop is made for file sharing among different iDevices, functioning like Bluetooth. With it, you can easily transfer photos, videos and so on from one Apple product to the other. Besides, transferring contacts to iPhone is also feasible. As long as your iPhones has this feature, then it would be very easy to send images from iPhone to iPhone 7. But note that you need to turn on both WiFi and Bluetooth to use it. Below is the detailed instruction. On your iPhone 7, swipe up from the screen. 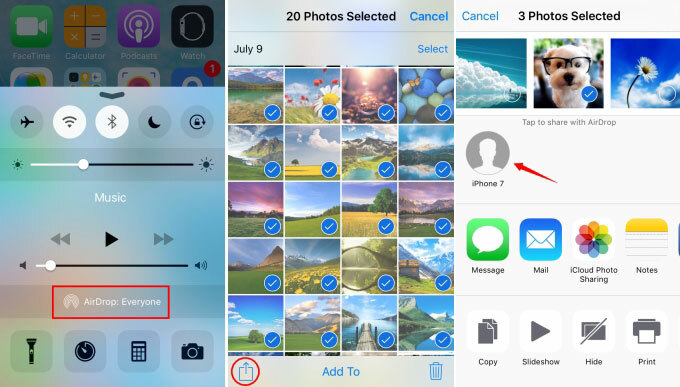 Tap “AirDrop” and choose “Everyone” so that your device can be detected by the other iPhone. On the old iPhone, open “Photos”. Tap “Select” button on the upper right corner. Select the pictures you want to transfer and tap the left icon at the bottom. 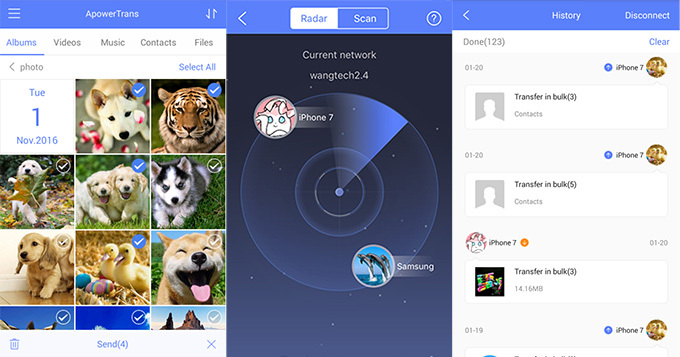 It will begin to detect the nearby devices which have opened AirDrop. Tap the name of your iPhone 7. Then there will be notification window on iPhone 7. Tap “Accept” to transfer. You can use it even when the two iPhone are connected to different WiFi networks. Please make sure that iPhone is unlocked during the process of detecting, or else it may not be found. All the transferred photos will be stored in Camera Roll by default. As cloud service becomes very popular in recent years, many companies have developed their own cloud service apps. However, iCloud is still top one for Apple users because of its easiness to access. 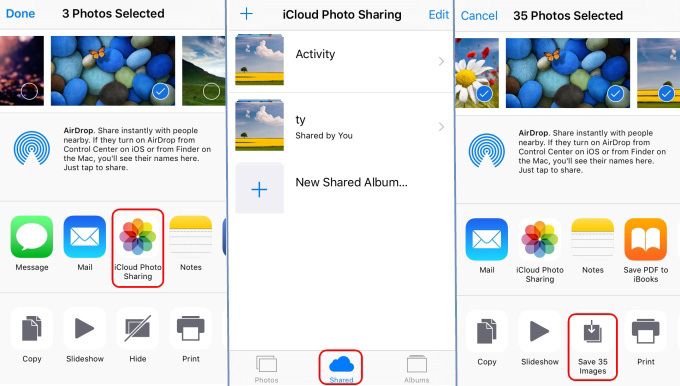 To use iCloud to copy pictures from iPhone to iPhone, here’s what you can do. Go to “Settings” and sign in the same iCloud account on both iPhones. On your old iPhone, tap on “Photos”. Choose the images and select the share icon. Tap “iCloud Photo Sharing” and then post. After that, on the iPhone 7, open “Photos” and choose “Shared”, where you will see the shared photos. Click “Select All” and then tap the share icon. Choose the “Save Image” button. 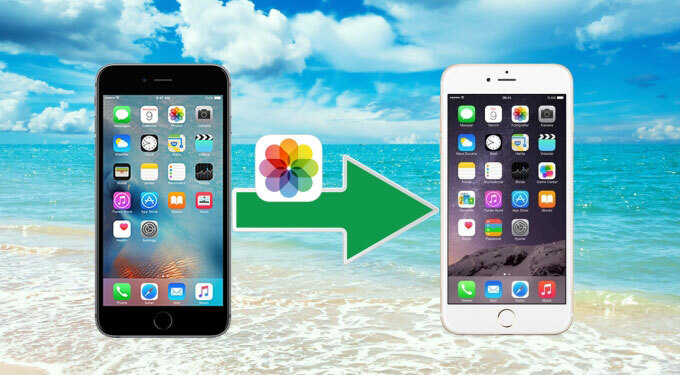 Now, you have mastered all three ways to transfer photos from old iPhone to iPhone 7. Actually, there are other desktop applications which can help you, as well, such as iTunes, Apowersoft Phone Manager, etc. It is really your choice to decide which one you would prefer. If you have a great amount of pictures, and you don’t want them to take up the space of your new iPhone 7, it is a nice option to store them to AirMore FlashDisk. With it, you can easily get access to the media files without storing them on your iPhone. Have a try! Rating: 4.2 / 5 (based on 22 ratings) Thanks for your rating!